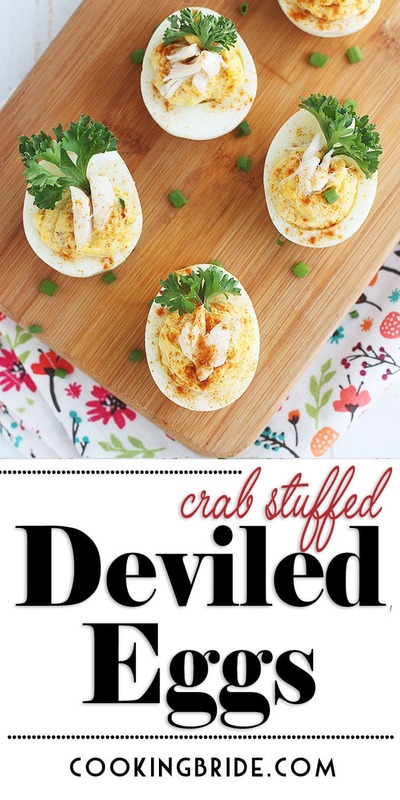 Up your deviled egg game with crab deviled eggs. Chopped crab meat, chives and Old Bay seasoning add a punch of flavor and create elegant presentation. Sure, classic deviled eggs will always be king. But why limit yourself to just one flavor? A simple hardboiled egg is like a blank canvas, the only boundary is the limits of your imagination. Up your deviled egg game with a little chopped crabmeat and a whole lot of flavor. When shopping for crab, you’ll likely notice different grades of crab meat. They are usually broken down into four categories – jumbo lump, lump, special, and claw meat. Jumbo lump meat is the most expensive. It includes large chunks of higher quality meat. Lump is a mixture of jumbo lump and special grade. 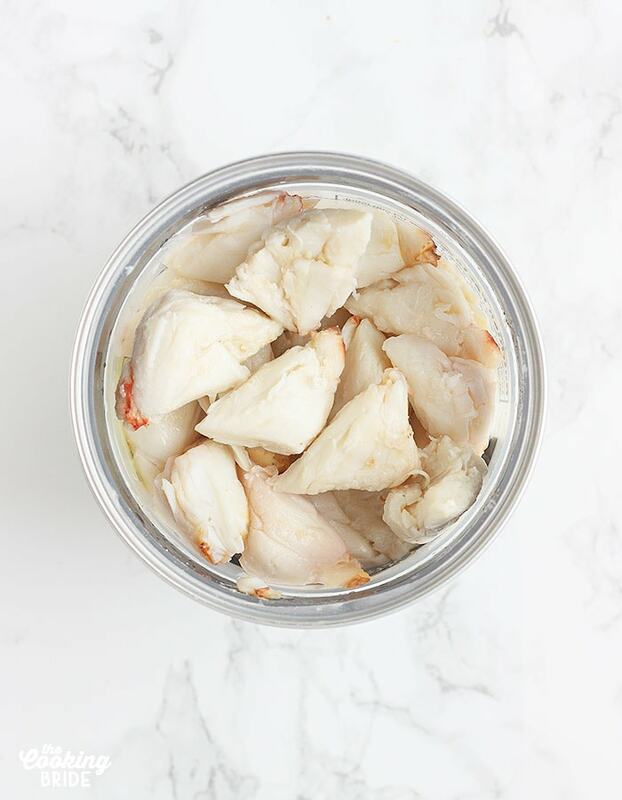 Special grade is comprised of smaller pieces of white meat from the body of the crab, while claw meat is extracted from the limbs of the crab and has a stronger seafood flavor. I used jumbo lump crabmeat for this recipe because I like the big pristine chunks and clean flavor. It makes for a more elegant presentation. However, one 8-ounce can typically runs me about $20-$25 – not exactly budget friendly! If you’re looking for an option that’s a little easier on your wallet, opt for lump or special. You’ll still get that light, clean yummy crab flavor. Stay away from imitation crab meat. Sure, it’s cheap, but it’s not real crab meat. It’s made from Alaskan Pollock and orange food dye. That’s why it’s called imitation. First, you’re going to want to hardboil six eggs. Check out this post for my cooking technique and tips for easy peel hardboiled eggs. After the eggs are peeled, cut them in half lengthwise and gently remove the egg yolks to a medium mixing bowl. Set the egg whites aside. Mash the egg yolks with a fork. Add ¼ cup of mayonnaise, one tablespoon Dijon mustard and one teaspoon of Old Bay seasoning. Then add two tablespoons of lemon juice, ¼ teaspoon hot sauce and two teaspoons of chopped chives. Stir to combine. Next, fold in ½ cup of crabmeat. If you have large chunks, you may want to chop the crab meat beforehand into smaller chunks. Folding means we are going to gently stir in the crabmeat so we can preserve as much of the texture of the meat as we can. Once the crabmeat has been incorporated, spoon the egg mixture evenly into the hollowed-out egg yolks. Garnish with additional chopped crabmeat, chives or parsley if desired. You can serve immediately. However, I like to let them chill in the fridge for a couple of hours to allow the mixture to set. Crab deviled eggs can be made up to two days in advance. Store them in a covered container to prevent them from drying and protect them from getting smushed. Deviled eggs can safely sit at room temperature for two hours. After that, they need to be moved to the fridge to prevent the formation of bacteria. 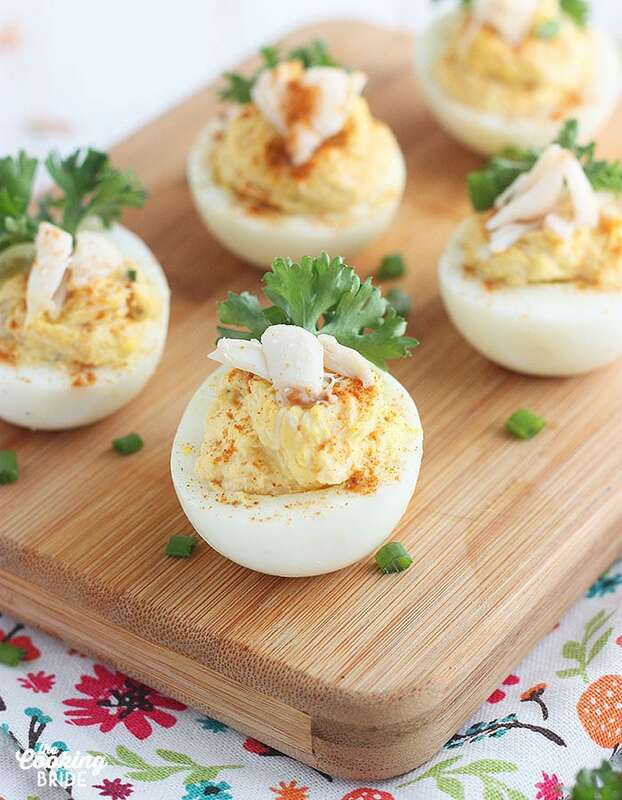 Crab deviled eggs can be stored in the fridge for up to two to three days. 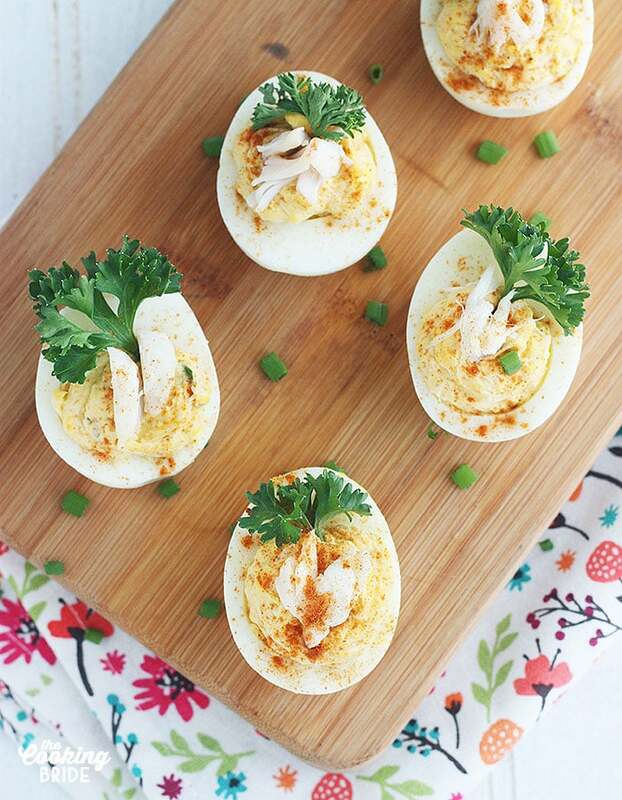 Up your deviled egg game with crab deviled eggs. Chopped crabmeat, chives and Old Bay seasoning add a punch of flavor and create elegant presentation. Cut hardboiled eggs in half lengthwise, then gently remove the egg yolks to a medium mixing bowl. Set the egg whites aside. Mash the egg yolks with a fork. Add the mayonnaise, Dijon mustard, Old Bay seasoning, lemon juice, hot sauce and chopped chives. Stir to combine. Fold in crabmeat. If you have large chunks, you may want to chop the crab meat beforehand into smaller chunks.